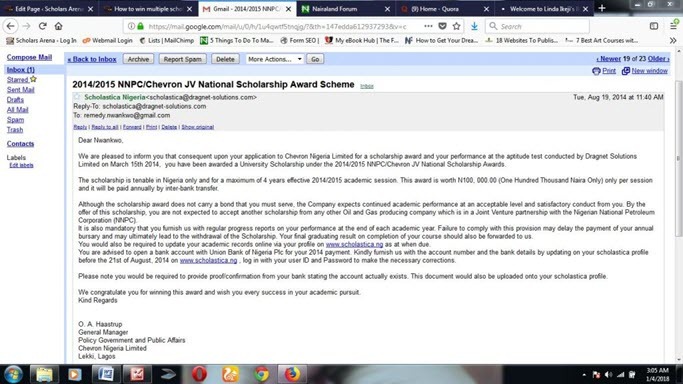 Dear Friend, Let me show you how to win multiple scholarships in Nigeria! Every year, certain Oil and gas, multinational and private companies award over 10,000 scholarship slots to different Nigerian students as part of their corporate social responsibility as mandated by Nigerian laws. Depending on the scholarship, students are paid amounts ranging from N100,000, N150,000, N200,00 to N300,000 every year to support their studies. 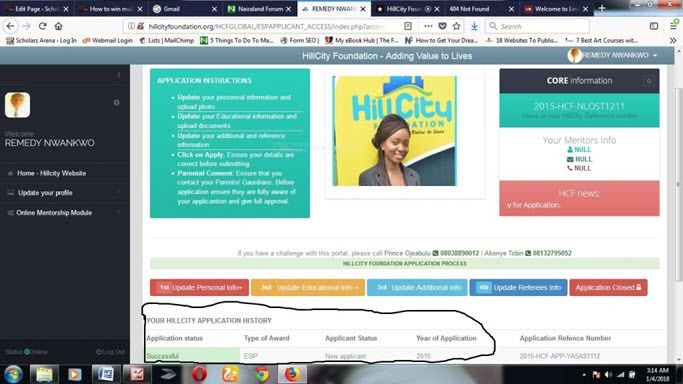 A few number of students who know when, where and how to apply for these scholarships have used that information to win multiple scholarships in school while the host of other students wallow in financial pain and lack. some of these students earn as much as N700,000 every year through multiple scholarships. The only difference between the students winning multiple scholarships from others is the quality of information they have! In scholarship pursuit, Information is everything! In Nigeria today, everyone desires to be educated but not many people can comfortably afford it because of the cut-throat cost of tertiary education in the country. Life in the university without proper and adequate funding can be a nightmare. An undergraduate or postgraduate student without good funding will always have his or her attention torn between surviving and academic obligations, which in turn affects his or her academic performance adversely. Let’s face it; don’t we all know that a responsible student with adequate funding would do fabulously better? 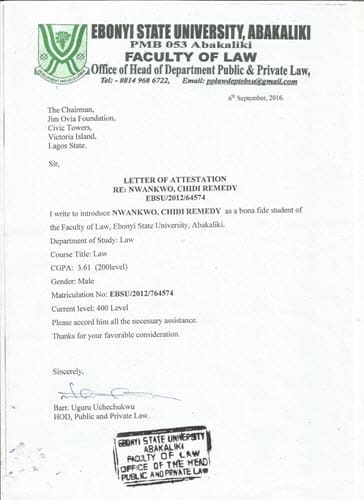 Every year, Parents and families struggle to foot the bills of their children and wards in tertiary institutions in Nigeria despite the conspicuous economic downturn in Nigerian. The Government seems to have a special mission to worsen things with the way tuition fees skyrockets every year to the dismay and detriment of indigent students. All these yearly financial headaches frustrate poor, average and middle class parents and their children in school. I know all these because I had been in that spot before now. I know what it means to remember that you have school fees, hostel and other related fees to pay every year while struggling to even maintain your 001 or 101 feeding plan, LOL! I experienced such agonizing situation in my first year in the Faculty of Law. My attention was divided and I could barely focus on studies. “No be person wey chop dey read? Many student in Nigeria go through all these without knowing that certain oil and gas companies in Nigeria award over 10,000 scholarship slots to Nigerian students every year as part of their corporate social responsibility! Through Scholarships, all that ended after my first year in school! With the above 5 awards, I comfortably earned N600,000 every year in school till my graduation. Money from the awards helped pay my school fees and hostel rent, relieved my parents of ALL EXPENSES regarding my education and ultimately made me save lots of money before I graduated from school. Dear friend, who said a student must be broke? My testimony could be yours too if you imbibe my teachings and follow my footsteps. I want to show you how to win multiple scholarships in Nigeria only if you give me the chance! Do you want to win multiple scholarships and make money in school like i did? Are you struggling with finances or funding in school? Do you wish to pay your school fees and other related fees effortlessly? 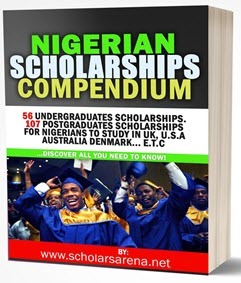 Do you want to have access to over 10000 local scholarships slots in Nigeria? Do you ever wish to study for free in UK, USA, CANADA, AUSTRALIA etc through scholarships? Do you wish to escape perpetual lack and save up good sum of money before you graduate? Do you know below average students are winning multiple scholarships because they know the secrets? Many students desire to win multiple scholarships in the university but they simply don’t know “How to”. I am almost sure you want the answer to that question too! 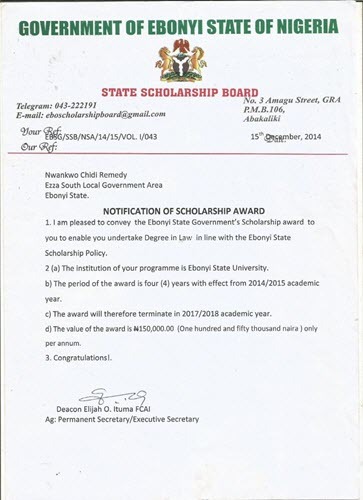 Top seven (7) easiest scholarships to win in Nigeria. Over 35 local postgraduate scholarships in Nigeria. Over 107 international scholarships for you to study Abroad at undergraduate and postgraduate levels. How, where and when to apply for these scholarships. How to access timely scholarship information for your application. A compendium of scholarships Past questions and answers and its magic! You will get mentorship and coaching directly from me till you win your first two(2) scholarships! You will be added to my Special Scholarship Mentorship group on Whatsapp. This is where I mentor students from different parts of the country, share daily powerful scholarship news and tips. The quality of Information contained in this book can easily change your life in and after school. Information contained in this book can change your personal and family finances as a student and as such should be very costly. However, I will be giving it at N2000 to the first 21 people to make payment! The price will go back to N5000 after 21 people get it. Diamond Bank / 0032679602 / Remedy Nwankwo Chidi. After payment, text me your name and email address via 08152054014. Once I confirm your payment, your copy of the book and all the bonuses will be sent to your email immediately. NOTE: The PROMO PRICE OF N2,000 is for the first 21 people to place their orders. After then, the book’s price will revert to the normal price of N5,000. NOW LISTEN: This book is meant only for those who truly want to take action to win multiple scholarships not for everybody. Last year, I helped over 400 Students in various schools in Nigeria to win Scholarships through my scholarship Mentorship program. This year, my target is to mentor 1000 students to win multiple scholarships all over Nigeria and beyond! 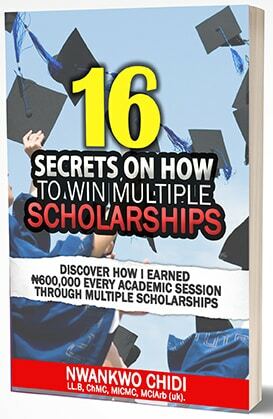 Get a copy of this book now to gain access to my Special Whatsapp group for scholarship Mentorship, where I will personally and practically guide you and many other students to win scholarships. See you in my Special Scholarship group on Whatsapp!